Save The Date: Great Gatsby Gala 2018! Enjoy a fun filled night including dinner and dancing while supporting an organization that will enhance the lives of many families in our community! There will be both a LIVE and SILENT auction! A cash bar and photo opportunities will be available. ALL GUESTS MUST BE AT LEAST 21 YEARS OF AGE! 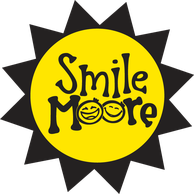 Smile Moore is an approved 501(c)3 nonprofit organization that will give grants to the children of widows and widowers, under the age of 18, for extracurricular activities, summer camps, birthday parties, and much more! This organization will also serve as a point of contact for the community resources available for both adults and children who are dealing with grief. If you are interested in becoming a sponsor, please download our sponsorship package below. Thank you so much for your interest and support in Smile Moore! I see it is past the deadline, are ya'll still accepting sponsorships?